2-- shipping charge in Canada to the USA : Canada Post Rates will apply. Shipping charges will vary, this is a guidleline Don provided me with I looked into shipping prices. For regular parcel to BC, it's about $15.00. For Ont, Que, about $11.00. Contact Don for exact shipping cost to your location. As Marland Murray sits in his cozy living room in the Martintown area house that his grandfather built, memories and recollections of the past bring a warm smile to his face and a sparkle to his eyes. Over the years, these memories evoked such strong feelings for local history that Marland and his wife Pearl preserved them in newsletters for the Cornwall Township Historical Society. In total, fifty one newsletters were published starting from1994. 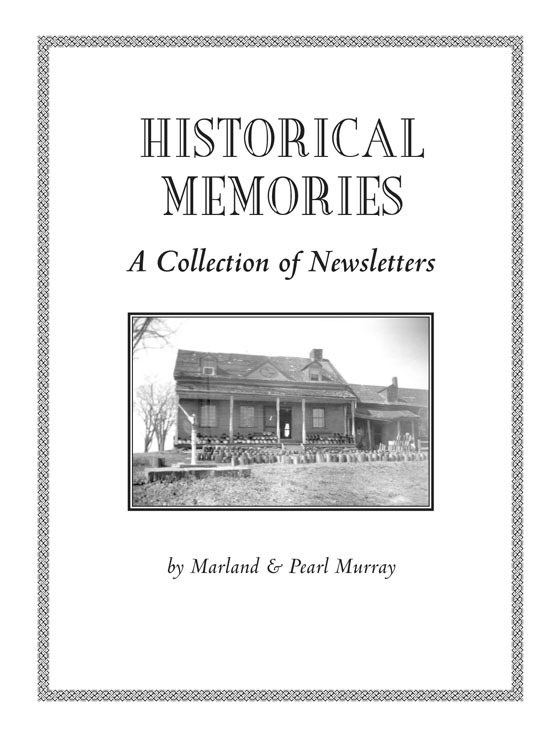 The book, appropriately titled Historical Memories: A Collection of Newsletters, is both archival and anecdotally based. It blends local stories from the past with major world events like the two World Wars. This is not Marland_s first book project. In 1994 he was Book Committee Chairman and played a part in publishing The Evolution of Stormont Agriculture. That book received high praise from the agricultural community in the area. Perhaps what kept Marland writing the Newsletters for so many years was the encouragement he received from his readers. _People sometimes contacted me and gave me their take on certain things I wrote about._ Others made contributions of their own to the Newsletters, writing about their recollections of growing up in the area. _We even held an essay contest that encouraged local students to write about someone or something historically significant._ Some of these student essays are published in the book. Anyone with roots in the area is sure to find something in the book that will pique their interest. Stories like Borden_s Dairy, Lawson_s Transport, the earthquake of 1944 and old love letters retrieved from a pioneer home are sure to evoke memories of days gone by. Despite the sadness of having to give up writing the Newsletters, Marland is pleased that a young Historical Society member has picked up the torch and will carry on the tradition. Wendy Fox, now living in Greeley ON but with deep roots in the area, is keen to preserve the tradition and build on the legacy that Marland leaves.